Benny sees a pending request on his dashboard. Evelyn sees on her dashboard that her request is waiting for Benny's response. Benny accepts. When I was in college looking to save money on recurring subscriptions (i.e., AT&T, Hulu, The New York Times, Spotify), I had to go asking around if someone would like to split their account / family plan with me. So I thought it would be cool if there were an app that would let you connect with verified strangers (meaning they're trustworthy) to join their subscription / family plan. Similarly, you can use the app if you are a family plan owner looking to lower your bill, and you are OK with letting 1-2 verified users into your plan. 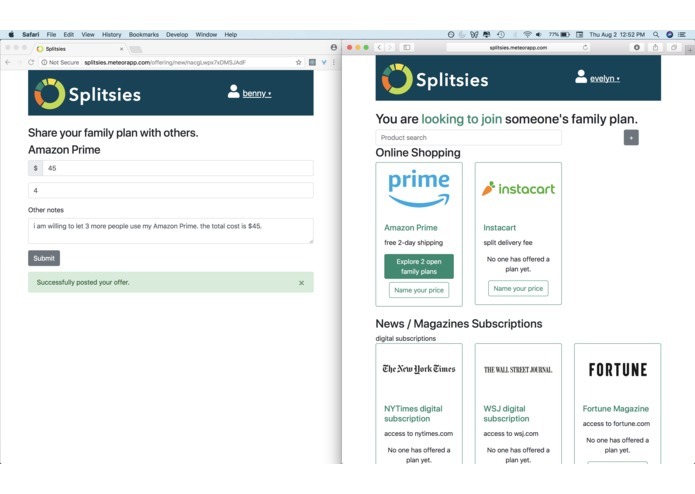 If you are looking to join someone's family plan, go to the homepage and click "Looking to Split." Browse through products / categories. Product categories include, but are not limited to, online shopping (Amazon Prime or Instacart to save money on shipping/delivery expenses), news / magazines (any online subscription like the WSJ or the NYTimes), video streaming (Hulu, Netflix, HBO), mobile plans, radio / music (Spotify, Pandora), and maybe even home / utilities (sharing your neighbors' wifi network). If you do not see anyone offering their family plan yet, click "Name your price" to specify how much you would be willing to pay to join their plan. Click the green button to explore offers (if someone already offered their family plan for the product you're interested in). You will see users (which can have a grey or a green icon to show if they have been verified) and the total cost of family plans they're offering to others. Connect with them. To track the status of your request, go to your dashboard by clicking the profile icon in the upper right. 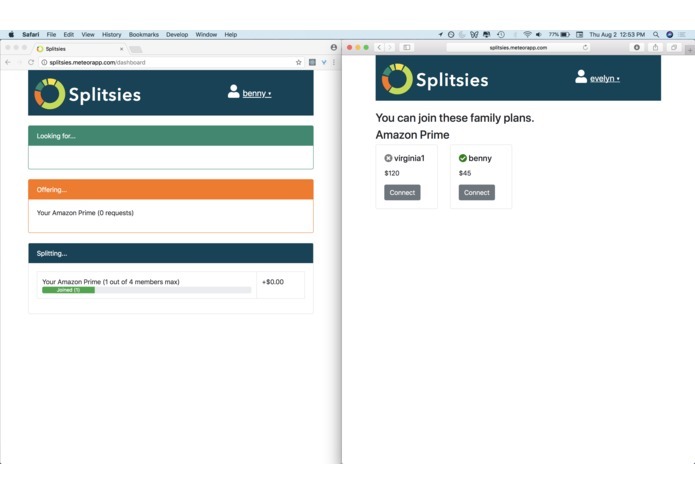 Once the family plan owner responds to your request, you will see the plan move down to the "Splitting" section which will show how many people are in that family plan and how much you owe to the plan owner. You will see your cost share dropping as others are joining the family plan and it reaches full capacity. If you have a family plan you want to offer for others to join, go to the homepage and click "Offer yours." To post your offer, click "Name your price" and specify the total cost of the family plan along with capacity (the max number of people, including yourself, that your plan can hold. If you see that people are already interested in a family plan for your product, you will see an orange button. Explore the offers (the price will reflect how much someone is willing to pay to join) and connect with verified users. To track the status of your request, go to your dashboard by clicking the profile icon in the upper right. Once the person replies you will see status change in the "Splitting" section, which will show how much in total you will receive from other people in your family plan. You will see that amount increase as others are joining your family plan and it reaches full capacity. 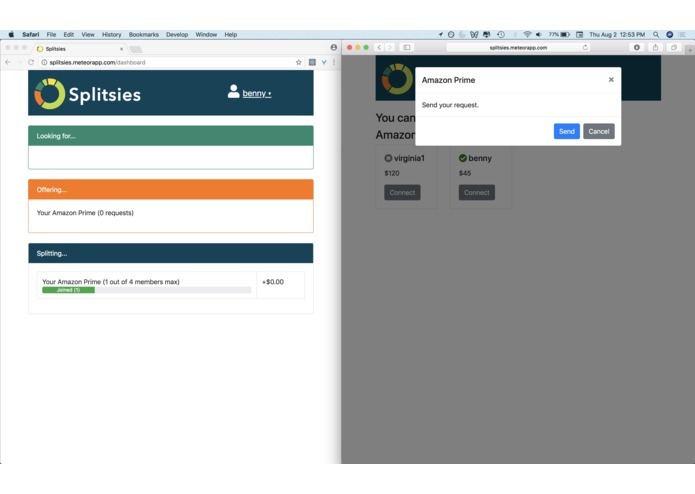 The app is built with Meteor, React, and MongoDB. Getting an initial prototype of this app up and running (deployed) in less than 2 days. 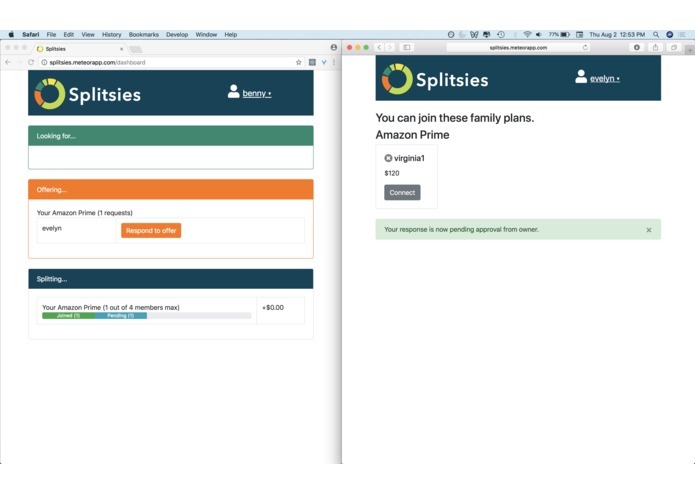 In the future, users will be able to pay (or receive) a single, aggregate monthly amount to Splitsies for all the subscriptions / family plans they have joined (or offered to others). 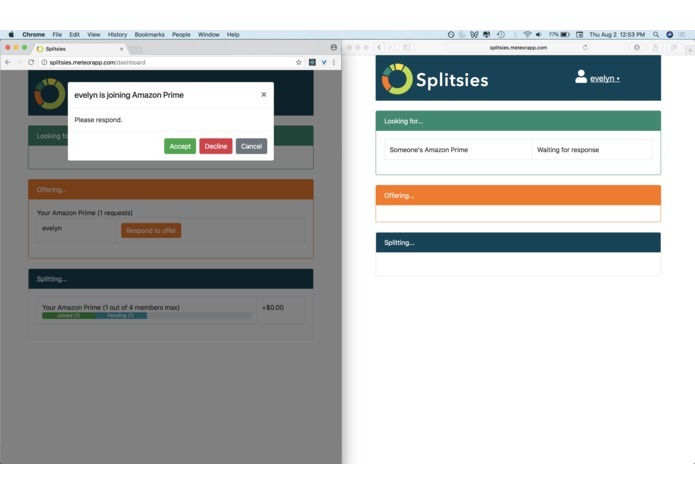 In turn, Splitsies will handle reimbursing all the vendors (AT&T, Hulu, The New York Times, etc.) 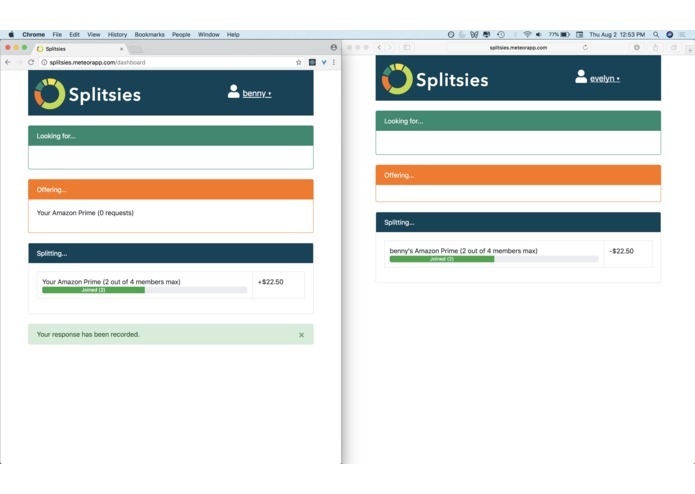 by sending a single payment for all the plans that are shared via Splitsies. Additionally, there will be a robust verification system (including social media, mutual friends, or prepaying the plan by 1 month) to ensure smooth user experience. We will also add statements like "others are paying this much for a similar plan" to ensure price requests stay reasonable and competitive. 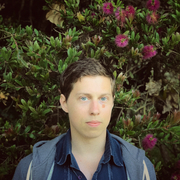 Wrote all the backend functions that handle the workflow, defined all subscriptions and publications, hooked the app up to a free MongoDB, and deployed the app via Galaxy.